You can do all your panning, distancing and even mixing from within the video window of your DAW (Reaper or Pro Tools HD/Ultimate). There is no need to have any plug-in interfaces open while working. For use in Pro Tools, Pro Tools HD 12.8.2 (or up, incl. Pro Tools Ultimate) and a Mac is required. No AAX plug-in for Windows, only VST3 is supported on Windows. Panning and the distancing of sound sources, operated directly from the video window. Convolution reverb with ambisonics impulse responses. The radar shows you the location of your audio in your ambisonics mix. Rotate or tilt an ambisonics recording so that misalignment and calibration errors of the microphone can be easily corrected. to name the most common. There are a number of playback platforms for 360 VR videos. All of these chose Ambisonics as the technology that allows for the interactively turning audio mix. This means that audio-post folks need to produce ambisonics mixes. Ambisonics mixes are in a format called b-format, which consist of four channels. B-format comes in two channel orders: AmbiX or FuMa. YouTube requires AmbiX b-format ambisonics soundtracks, so this is what 360pan delivers. Facebook requires 2nd order ambisonics, 360pan suite 2 also delivers this. 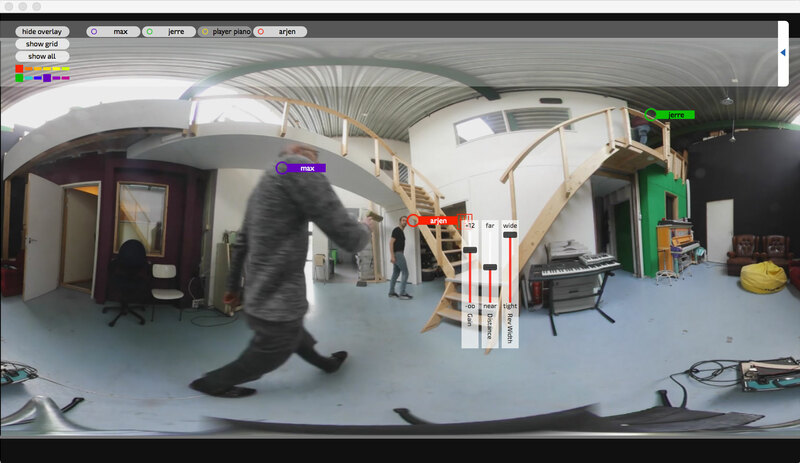 360pan enables you to pan mono, stereo or four channel input files into ambisonics, using pucks that move on top of the (Pro Tools HD/Ultimate) video window. Gain, distance and reverb width, along with the puck itself will show up in the (Pro Tools HD/Ultimate) video window when a panner is inserted and ‘show puck’ and ‘show overlay’ are switched on. The three sliders appear when you click the three slider icon that shows when you hover the mouse over a puck in the video window. mono or stereo sources are converted up to ambisonics, while giving it a left-right, up-down, and distance position in the ambisonics bus. A panner is inserted on each sound source track to do this. So panners get mono or stereo (or even 4channels) of input and output ambisonics. Each 360reverb creates a private ambisonics input, kind of a backdoor, only accessible by the 360pan instances. Each 360reverb shows up as a send destination in each 360panner. This ties the 360pan’s to the reverb in such away that you can adjust distance and reverb-width per panned source. This goes for an unlimited amount of sources even if there is only a single 360reverb in your project (which is the most usual setup). Besides all this the usual main input of the reverb still functions (also simultaneously with the private input). Turn position blur up to create sound-objects that should appear bigger than a point-source. The panning position will then be their center, and they will become larger in the mix. If position blur is turned all the way up, the audio is mono and will not move at all when the listener turns his head. You can use this to mix voice-overs or (mono) music that shouldn’t move. Pan stereo music hard left and hard right and open up position blur halfway to create a head-locked effect in an ambisonics mix, That does not require separate head-locked tracks. In the picture the mix format selected is 8 channel (8 ch). This 360monitor is therefore on an eight channel bus (7.1). It folds the audio down to 2 channels for headphone listening. It does that in the way described technically in Appendix 2 ‘Ambisonics to binaural conversion’ from the 360pan suite manual. Tip: 360monitor can be heavy on the CPU when it is visible. This is because it is transporting frames from the Pro Tools HD/Ultimate video window to the 360monitor user interface. The smaller the Pro Tools HD/Ultimate video window, the lighter 360monitor operates. A low cost bluetooth connected head tracking unit that can be attached to your headphones and can steer the 360monitor. That more closely resembles the way your mix will be listened to by the end-user. Appendix 3 in the 360pan suite manual describes the use and calibration of the head tracker. Please note that when you source this tracker elsewhere (not from Audio Ease) you have to ensure a battery is included. 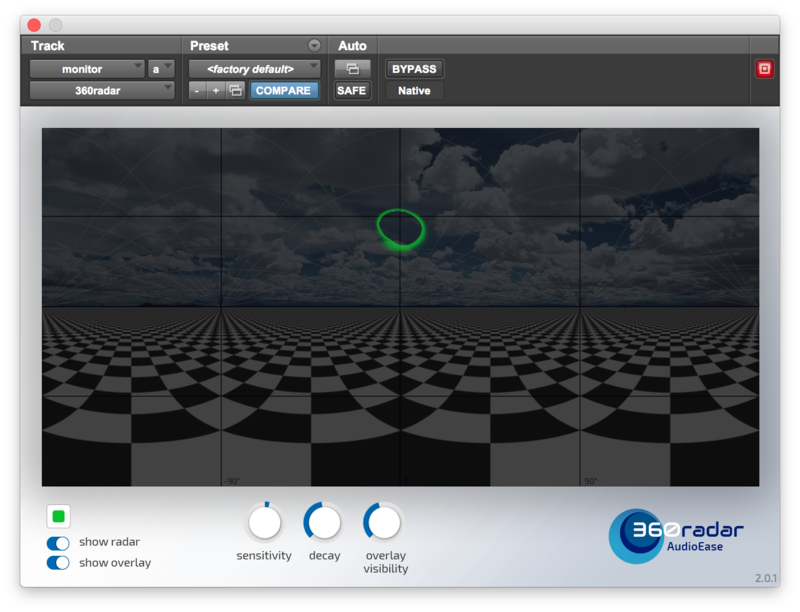 360reverb is the first truly omnidirectional convolution reverb. A single instance can can provide pan-following reverb with individually adjustable reverb width for an unlimited amount of sound sources. The dry/wet balance and the spread controls only function on the main (traditional plug-in) input of the reverb. 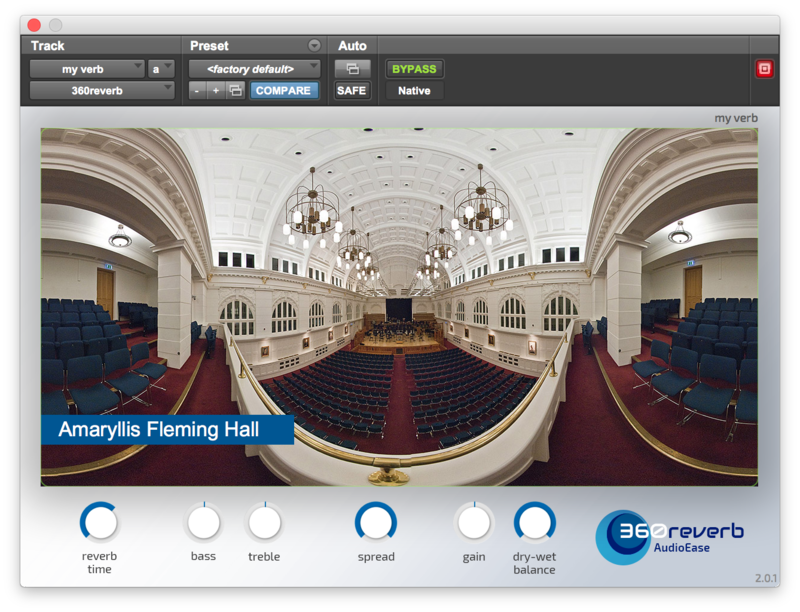 360reverb accepts ambisonics input and delivers ambisonics output. There is a separate private input that is selectable in all 360pan plug-in instances. The dry/wet balance and the spread controls do nothing on the private audio lines each 360pan has to the reverb. The distance and reverb-width parameters for the private inputs are set in the 360pan plug-in (or through the popup faders in the video overlay). 360pan suite, Facebook, Oculus Video, YouTube, SamsungVR and Oculus all use AmbiX b-format. Then make sure you insert a 360ambix to fuma in the ambisonics channel that you bounce, in order to get the FuMa channel order (and normalization) that is required. 360pan suite works with standard AmbiX channel ordering and normailization. This means you can directly use the output of any 360pan suite plug-in as AmbiX ambisonics signal. There is no need to use convert or export plug-ins. This also allows to mix any other plug-in that supports AmbiX ambisonics audio. 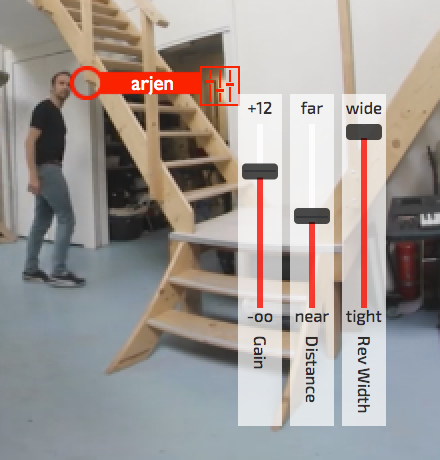 pan your audio to ambisonics using the easy video overlay. monitor ambisonics audio and preview 360 video. see your ambisonics audio in the video overlay. easily fix misalignments in ambisonics signals. convert first order FuMa ambisonics audio to AmbiX. convert first order AmbiX ambisonics audio to FuMa. The 360pan suite of plug-ins is protected using a single license. An iLok (second or third generation) USB key can be used however this is not required: the license can also be activated on a machine (computer) using the ilok license manager application. A free ilok.com account is required for this. 360pan suite 3 requires the ambisonics tracks introduced in Pro Tools HD 12.8.2. This sets the requirement to Pro Tools HD 12.8.2 or up (incl. Pro Tools Ulitmate). If you use an older Pro Tools 12 HD / Pro Tools 11 HD version please use 360pan suite version 2. Initial release, AAX, for Mac OS. The 360pan suite of plug-ins is protected using a single license. An iLok (second or third generation) USB key can be used but is not required, the license can also be activated on a machine (computer) using the ilok license manager application. A free ilok.com account is required for this. There is only a single AAX and VST3 plug-in which, once installed, will manifest itself as a number of plug-ins in Pro Tools HD/Ultimate / Reaper / Nuendo. 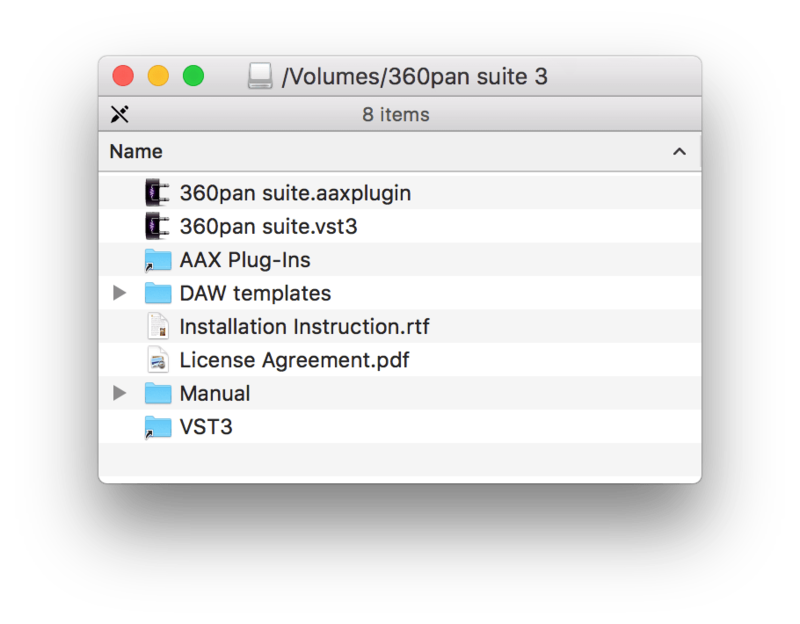 On macOS installation is done by unpacking the downloaded zip file, opening the dmg file and dragging the 360pan suite plug-in (.VST3 or .AAXPLUGIN) into the right alias (shortcut) to copy it to your Plug-Ins folder. On Windows unpack the zip file and then run the installer.exe to install the VST3 and AAX plug-ins. In the downloaded you will also find the manual and the DAW templates. 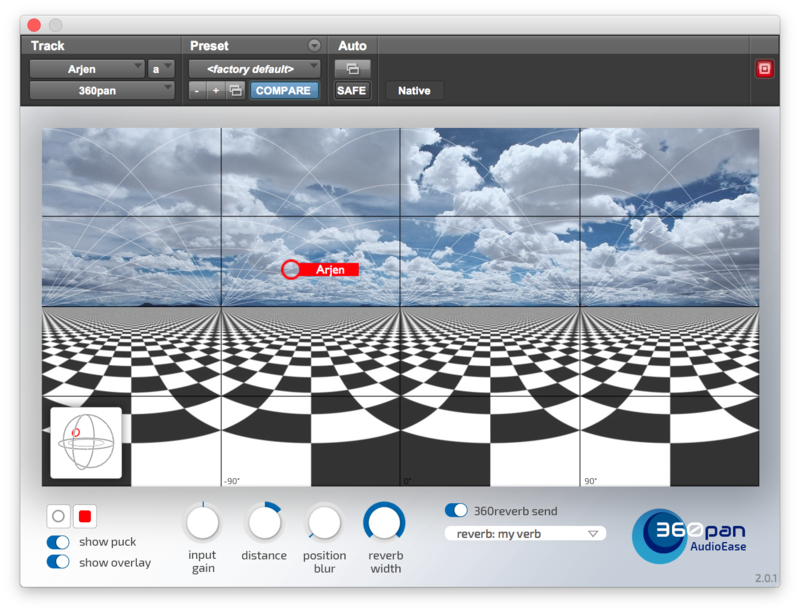 Request a link to the downloads page with the latest 360pan suite plug-in downloads. Plug-in format specific documentation for the VST3 and the AAX plug-in. Quick start: download & check out the example session / project for Pro Tools HD/Ultimate and Reaper. Wrap your head around the basic DAW setup for ambisonics audio production using one the 360pan suite templates for Pro Tools HD/Ultimate or Reaper. The 360pan end user license agreement (eula). Here we offer a bunch of free ‘spatial treats’ that we use at Audio Ease ourselves on a daily basis. There are no warranties, and almost all of it builds upon either Google's Omnitone or FFmpeg. Preview your 360 Video with immersive audio right from your own hard drive or network instantly. No upload, not public, no social media, no trickery, no jump inspector or android required. Works in Firefox on Mac or Windows. Nudge forward and replay seems broken in Chrome, Safari won’t do a thing at all. Because the video is nice and big it this sometimes preferred over previewing in our 360monitor plug-in. AND the best part: you don’t need extra’s like jump, or an android phone. This page uses Omnitone, Google’s own 360 web API which means you are listening to the same ambisonics to binaural rendering as the android and desktop clients viewing YouTube use. It being Google’s also means it likes .webm. Of course none of the data compression that is going on might be happening when you actually do upload to YouTube. However this is a lot quicker (and safer!) than uploading. The files play locally from your (network) drive, after loading the page you can pull internet and it would remain working (just to prove that nothing goes into the internet). Optionally the site enables you to side-load a separate 4 channel wav audio file. Simply point to an interleaved First Order Ambisonics AmbiX .wav file (4 channels, WYXZ order), hit play, drag to turn, scroll wheel handles distance (field of view). As hires webm conversion takes a bit of time, we like to make our webm once, and then, for each mix, we just bounce a wave file from Pro Tools HD/Ultimate and only load this separately. Arjen, sadly, has not yet been able to type a single ffmpeg command line right in one try, so Aram built him a few droplets that will perform common tasks on videos. The result is saved next to the input video. The ffmpeg must remain next to the droplets for them to function. drop any video to convert to a quarter of the resolution and to DNxHD. This makes Pro Tools happy and spiffy. (we convert samsung gear stitched 360 stuff with this). crop a stereoscopic video to the left side only, saves cpu load and screen room. And of course you are free to open the apps (droplets) with the Script Editor app to check what's going on and adapt if required by taste. 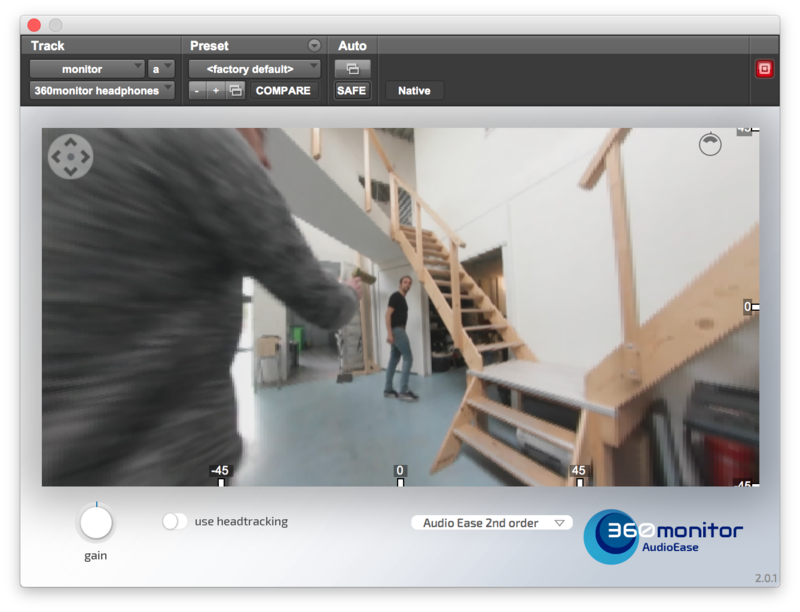 Quick start: download & check out the example project / session featuring a short 360 video of us running around at Audio Ease, mono panning audio, a true ambisonics recording, binaural preview and export suggestions. Open the practice project START and open the workflow video and practice along with the video. Yes, two 360pan suite manuals. One for VST3 and usage in Reaper and one for AAX for usage in Pro Tools HD/Ultimate. To kickstart your new VR/360 audio post project use one of our templates. All routing/bussing done for you already, import the audio and video and start mixing. First order (1OA), second order (2OA) and third order (3OA) templates are included. Mixing non-turning audio, like Voice Overs, using position blur in 360pan. The first channel of the ambisonics stream is the W channel, which goes to all virtual speakers in the ambisonics to binaural converter. This means you can place non-turning mono audio there, great for voice overs. Position blur does this. With position blur all the way open your panning is gone and the audio is mono an everywhere, with the control all the way down the panning is very precise and the audio is a point source. With the blur parameter you can make panning less hard and create clouds of audio. This way you can position stereo input, add blur and create a stereo sensation while the audio does not turn when a users turns around in the VR. Follow these steps to upload 360 video with ambisonics audio to YouTube. So that the viewer gets interactive turning audio when looking around in the VR video. Mix your audio and place (pan) it using the 360pan suite. In both situations bounce as quad (four channel) interleaved wave audio file (not compressed). 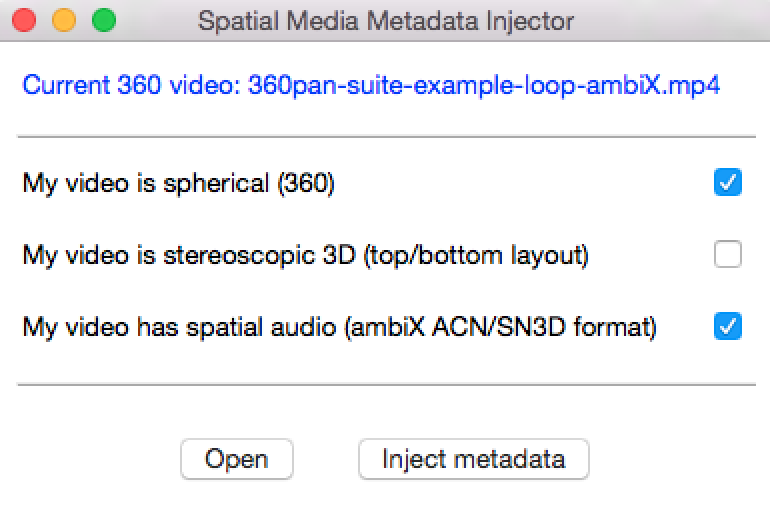 Open your video with the quad ambisonics audio in the Spatial Media Metadata Injector app. Inject metadata, upload to YouTube, wait an hour for your 360 video to process. Watch in a modern browser (Chrome works for sure, Firefox and Safari might work too) to verify you get spatial audio (look around with headphones on!). Bounce or export a second order ambisonics AmbiX interleaved audio file. (this is the 9 channel output from the Audio Ease 360pan suite). Use the FB360 encoder app. Under ‘spatial audio’ select your mix and set it to B-format (2nd order ambix). Do not check the 'From Pro Tools' checkbox. Select your headlocked stereo output and your video and then encode to a Facebook 360 video. If you have a Samsung GEAR VR and a compatible Android phone you can check/preview your mixes locally on the HMD without uploading (side loading). Follow this guide to get audio that will enable an immersive experience. - copy the injected video to your Android device, by using SideSync app for instance. Add it to a folder on the root of your device called "MilkVR". - in the Samsung VR app hit the folder for local files then look under side loading and your video should be there. - encode - copy the encoded video to your Android device, by using the SideSync app for instance. Add it to a folder on the root of your device called "MilkVR".